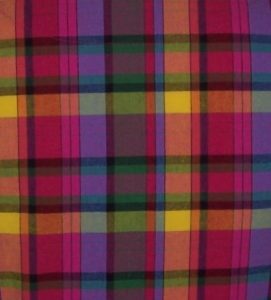 When visiting the Caribbean earlier this year, I made a point of buying some colourful Madras Cotton Check fabric when we called into Barbados. Since my return the fabric has been washed and waiting quietly in a corner for me to make into a dress as a memento of a lovely holiday. Being somewhat down-hearted about the previous make using some unrepeatable fabric, I thought that lightning would not strike twice so went ahead and cut out another sleeveless shirt dress. This time I changed the collar to that used on the Kitty dress which I find very easy to make up and would hopefully reduce the time it takes to complete the construction. 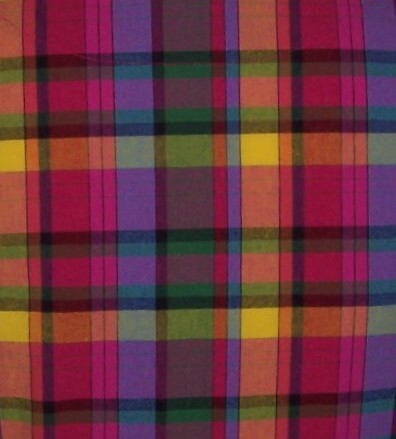 The check on this fabric is uneven so I tried hard to place the design lines in a complimentary fashion. I think that it has worked and there are no glaring faults. Truthfully, most of the colour placement is a happy accident although I did take care to match the horizontal lines of the check. I am particularly pleased with the way that the collar check lines are in a chevron. I cut the skirt as 2 panels each 30 inches long and this has made it possible to have a deep hem. The centre back seam is a flat fell seam with the second row of stitching completed by hand. The panels were pleated onto the bodice with inverted pleats lining up with the darts and side seams of the bodice. There is a pocket set on the right-hand-side of the skirt, hidden beneath one of the pleats. The hem was overlocked then turned up just once and hand stitched in place. I used a very lightweight fusible interfacing in the collar, facing and button/buttonhole plackets. The armholes have been bound with a self-bias binding cut 1¼ inches wide and folded in half. All seams have been overlocked including around the pocket bag. There are 12 buttons down the bodice and skirt which came from my button stash. Buttonholes were worked on the machine and taking a hint from Sian of Kittenish Behaviour, I have used fraycheck ® for the first time.